My prejudiced and fatigued eye would declare it a split decision. Others who participated may beg to differ. The facts: There had never been an international show in northern New England. The Maine Society solicited co-sponsorship from the NEGS. Officers in the Canadian, Connecticut, Empire State, Western Maine, and Quebec societies were asked to notify their members. 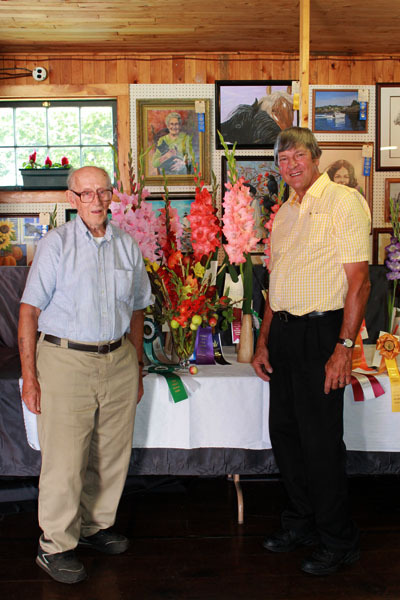 Cliff and Doris Hartline were asked to come east to head the judging. They accepted, never having been Downeast. On August 26, it was announced that the opening day -- August 28 -- of the Windsor Fair was to be postponed, due to the advance of Hurricane Irene. This was to have been the day of the glad show. The fair’s opening day had never been postponed, going all the way back to the fair’s founding in 1888. Panic time. We moved the show to Monday, August 29, but had little time to notify potential exhibitors or attendees. Seventeen had attended the final pre-show dinner on the 27th, including the Hartlines. 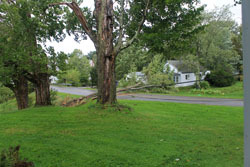 Irene, no longer a hurricane but still a powerful tropical storm, drove into Maine on the morning of the 28th. At 2:30 pm, the power went out at the Cates family’s farm, leaving us without a computer, a landline, or the ability to charge cameras and cells. Most important, there was no power in the cooling room, which contained both show glads and flowers for sale to florists throughout central and southern Maine on Monday. Second panic time. 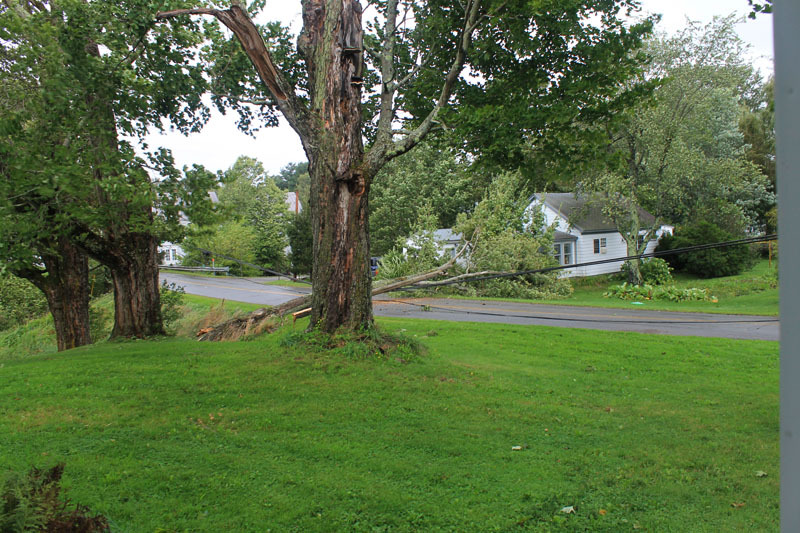 An ancient maple at the edge of the property crashed across the road, taking a utility pole with it. The Cates sons, living nearby, never lost power. Son Chris brought a gasoline generator—unused in years!—and hooked it up directly to the cooling system. We filled out show cards by candlelight. And, over supper, such as it was, a new culinary term was coined by Margaret Cates: candle toast! At ten that night, the generator failed. Third panic time. Monday morning: Bright sun. The van was loaded by 7:30, and we made it to the fairgrounds by eight. No bottles had been filled with water because we’d been unable to get in on Saturday or Sunday. Class cards could not be found, and other calamities ensued. Some growers were unsure of the names of some cultivars they were showing. Exhibitors were still setting up at noon, when judging was supposed to begin, but the Hartlines are amazingly efficient judges, and it was done well before two, when the show opened to the public. Margaret Cates was likewise a model of efficiency clerking for them, and getting the results down on the official NAGC form. She and Russell Martin took many photos. One hundred forty-three spike entries were shown by thirteen exhibitors, Paul Cates could have entered fifty more had there been the time. 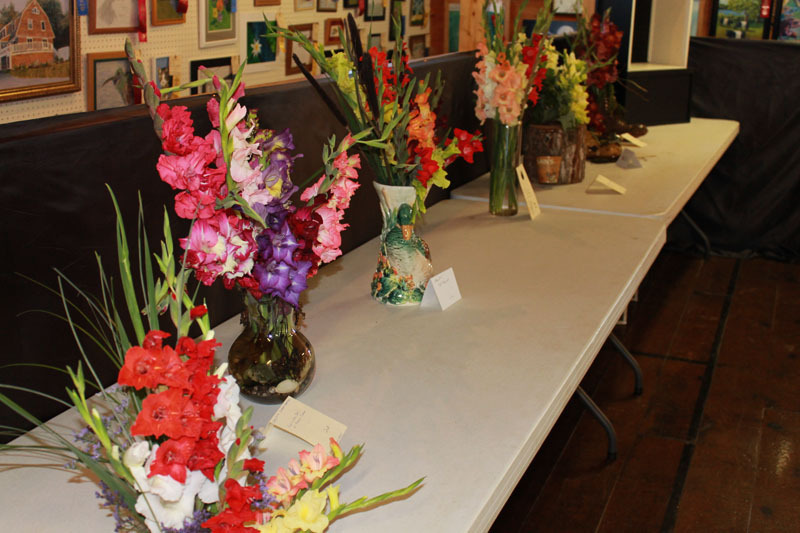 Three entered in the arrangement and vase classes. 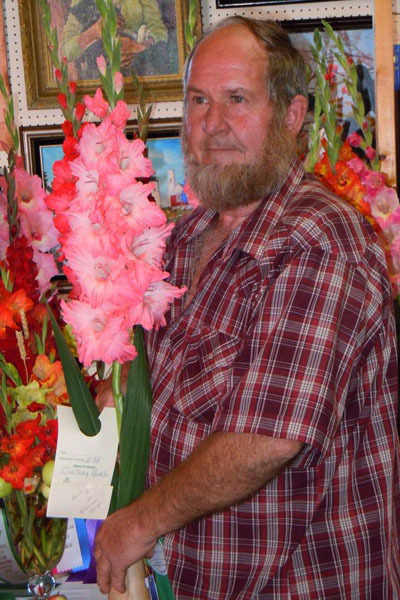 No Ed Squires Award was given, as there were no three-spike seedling entries, as was also the case at the 2010 Eastern International at Bill Owen’s farm. Come on, friends! The Large Champion (and overall Grand Champion) was a Cates family-entered spike of Hartline’s Scarlet O’Hara. A Joyce Mosher-entered spike of Labrum’s Century Mark was overall Reserve Champion, as well as Reserve Large Champion. Cherokee Nation (again from Cates) was 300 Champion, with an Arthur Mosher-entered spike of My Love as Reserve 300. Small Champion was Cool White and Reserve Small Jo, both exhibited by the Cates family. A Joyce Mosher-mounted Tampico was Large 3-Spike Champion, and Brown Star won best Small 3-Spike for the Cates family. Best seedling was Oliver, from the Cates family. Donovan Desrosiers took Best Novice with Blackout. Shadow Dancer and Spyro, both Lyle Madeson introductions, won Youth Champion and Reserve Youth Champion for Nicholas and Ethan Cates, respectively. Cates family spikes of Cut Above, Green Magic, and Bluebird took Best All America, Old-Timer, and Reserve Old-Timer. Cool White was judged best eligible for the Ray Dittus Award, with Cut Above and Huron Flair, both 2011 introductions, coming in second and third. The People’s Choice was hard-fought, with Arthur Mosher’s entry of Showbound edging out the Cates entry of Ebony Beauty by one vote. 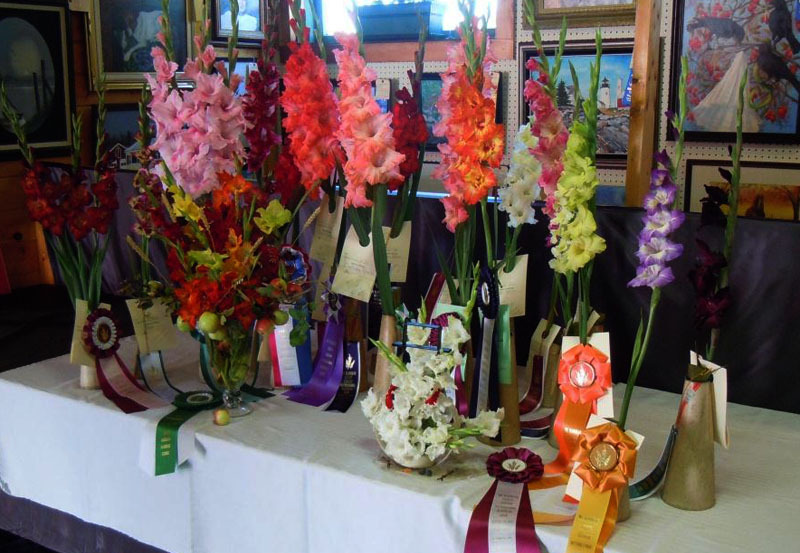 Vicky Mosher entered arrangements in all six classes, with her “Fall Harvest” judged Champion and her “January Thaw” Reserve Champion. Frankly, I found her “Mud Season” and “Spring Time in Maine” better still, but who am I to contest Doris’s judgment? Phyllis Campbell entered two good arrangements as well. Laura Foote took Best Vase. There were no Basket entries, although Faith Ames brought two beautiful mixed baskets to surround the photos of Bob and Dorothy Martin, to whom the show was dedicated. Spikes were sold for five dollars a dozen as the show was broken down; the Maine society took in enough money to help pay for a color spread in the winter Glad World. My sister Prudence, her companion Sheila, and I bought two dozen to take back to their place in New Gloucester, where I emasculated five to bring the anthers back to New York for crossings. Over two hundred fair goers wandered through, and five or more signed the MGS book requesting more information. At least one asked for information as to how to join the NAGC. Without Irene, we would certainly have had more exhibitors, as well as many more attendees. I suggest that the NAGC mandate that International shows include a Recent Introductions class, which would have brought at least two more to the Court of Honor. It should likewise mandate that every International show include a Decorative class, if we are truly serious about promoting same. 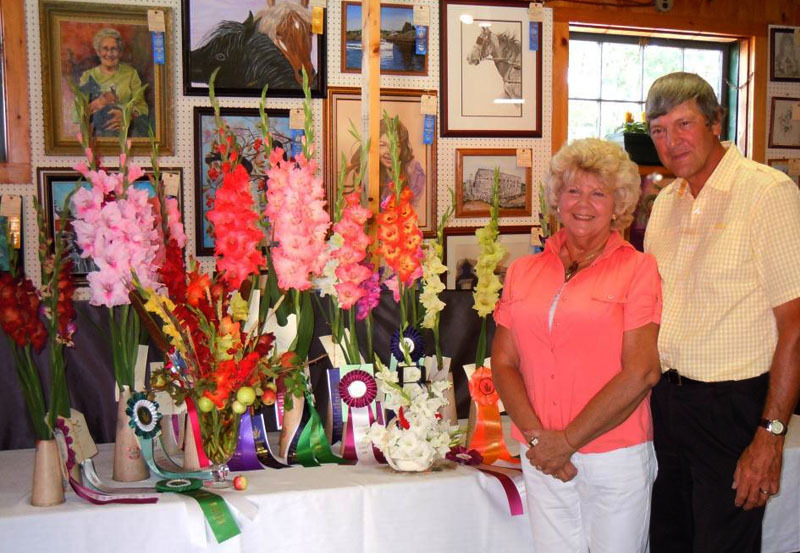 Cliff and Doris, after the judging, walked exhibitors through various dressing suggestions, which was greatly appreciated by all. We hope that they had a great time on Mt. Desert Island. I made it home in normal flying time, after having passed ten miserable hours getting from LaGuardia to Portland on the way up.